Many professional websites change their designs over time in order to cop up with the latest technology and trend. Gone the days of designing websites with HTML tables and now everyone uses CSS. Nowadays most of the new templates are following responsive concepts because of the popularity of smartphones and tablets. It is a must for fresh candidates to learn fluid design and bootstrap to get a job as a designer. However, it is interesting to view the design changes of popular brands over time to understand the way they responded to changes in technology. If you are interested to check the historical outlook of a website, you can view its historical screenshot using online tools explained in this guide. Most of those tools are free. I hope this tutorial will help web developers and ordinary users who are interested to watch the changes in web templates of any websites over time. Whenever I want to see the historical layout of a website, the first tool that comes in my mind is Internet Archive Wayback Machine. They have a large collection of web screenshots saved in their database. It is very easy to use this tool and here I demonstrate the procedure to find historical layouts of CoreNetworkZ.com using this tool. You can use the same procedure for any domain names. Wayback Machine displays the number of screenshots taken by them over time. All you have to do is to click on the date on which they have a screenshot saved. You may click on the blue circle to view the screenshot took on that day. 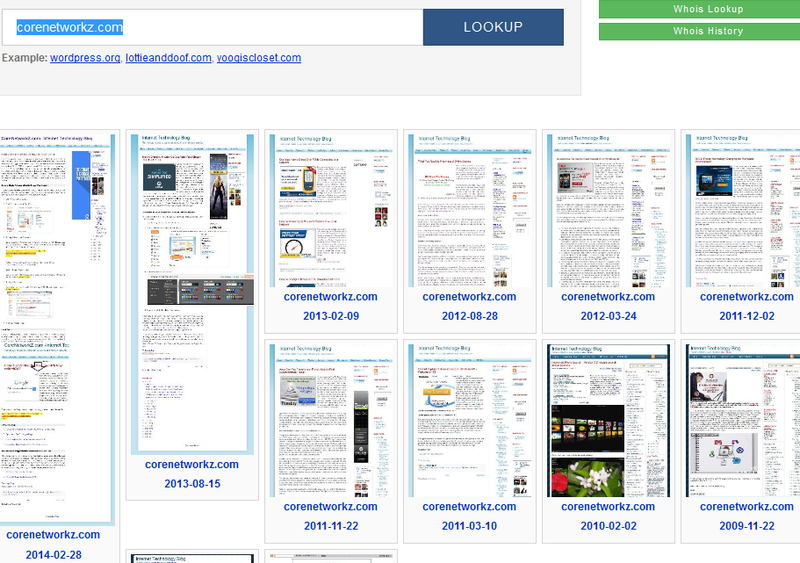 Another important tool to view the past design of a website is Domain Tools Screenshot History. It is also a free service and very easy to use. Using this service I am going to check the historical screenshots of CoreNetworkZ.com. Now it will display all available screenshots of CoreNetworkZ. These services are handy due to a number of reasons. It is easy for a website designer to find out the past layout of an expired domain which is no longer available with Google Cache. One of my friends let accidentally expire his domain name and hosting. He purchased it back from the expired domain bidding but completely lost the website files. With the help of http://archive.org/web/, I recovered his website design. These services help us closely monitor how big brands accommodate the latest technologies in their websites over time.